How to change registered email address. The latest update of SkoolBag requires users to register for an account. Your SkoolBag account enables you to keep your SkoolBag information in sync across multiple devices. It also enables you to subscribe to specific groups that your school has set up. You only need to register once - you can then log in with the same username and password across all of your devices and if you get a new phone. Please follow the instructions below if you are having trouble creating or accessing your SkoolBag account. On registration you will be prompted to confirm the email address before you can proceed to log into the SkoolBag app, If you have not received an email with a confirmation link for your new SkoolBag account, please close the app and restart the registration process. 06. Open the confirmation email and click on the confirmation link or copy and paste the link into your browser. 07. On a new web page, you will see the following message confirming your email address. Important Note: If you do not receive the email to your inbox, the settings of your email account may have diverted it to your junk or spam folder. Please check these areas of your email account. Example screenshots from Gmail and Outlook are below for an example of where to search. If you have forgotten your password you can reset it via the reset password option found in the login/registration menu. 02. On the Login page Click on > Forgot password?, which is found below on the Login page. 04. An email will now be sent to the inbox of the email address you selected to send the reset password link. 06. Add the new password and click on > Reset Password (passwords must be between 6-30 characters long). 07. You can now log in to your SkoolBag app with the new password. 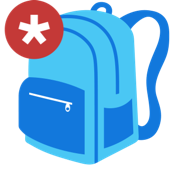 Important Note: If you are unable to reset the password via the reset password option, contact your school's SkoolBag administrator and they will be able to reset your password. 01. Open your SkoolBag app on your mobile devise. 02. Select the Profile Tab at the at bottom of the SkoolBag app. 05. If successful you will receive a message confirming that your password has been updated. If you are still experiencing issues you can submit a support request.